Located just 9 miles from Guildford on the Surrey/Sussex border, Wings & Wheels showcases some of the finest civil and military aircraft displays in the UK. Combined with an astounding line-up of record breaking cars and motoring demonstrations, our Airshow is unrivalled by any other family day out. On the ground, Brooklands Museum mastermind an array of iconic motoring classics over two hours on the runway and Top Gear track. All eyes then lift skyward to see five hour flying displays led by a crowd thrilling assortment of RAF legends, which have included The Red Arrows and Battle of Britain Memorial Flight, as well as civilian aircrafts such as the Jet Provost Pair, de Havilland Vampires and Blades. A jam-packed 32-acre arena boasts a host of activities and entertainment, including the popular Military Zone, Wheels Zone, live music, themed retail outlets, military outlets and displays, static aircraft, fairground and emergency services demonstrations. Each year Wings & Wheels is supported by a variety of companies and individuals. Together these have helped Wings & Wheels grow in stature and reputation, with the event now achieving between 25,000 and 40,000 visitors. 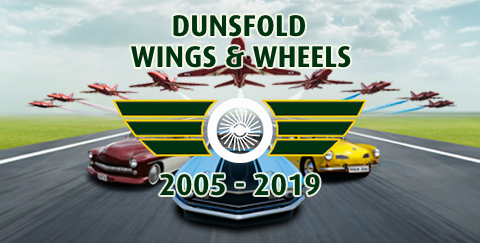 So, whether a wide-eyed first timer, a seasoned veteran, aviation buff or motoring enthusiast the Wings & Wheels experience will leave you breathless! If you would like to participate in the Show please visit our Exhibitors page for more information.